By combining a method – comparative studies – with an ongoing process – the internationalization of law, that is, its extension beyond national borders – this Chair looks to the future, as uncertain as it may be. Of course current events tragically highlight the absence of a real legal world order. The collective security system of the Charter of the United Nations has shown its weaknesses and law has been unable to disarm force. Conversely, however, force cannot prevent this unprecedented extension of law, to the extent that no State can lastingly override it. In spite of appearances, it is no longer possible today to ignore the superposition of regional, national and global standards, nor the over-abundance of both national and international institutions and judges, with expanded jurisdiction. The new realities are causing law to evolve into complex and highly unstable interactive systems that are perhaps more symptomatic of profound change than of the defeat of law: we are faced with a change in the very conception of the legal order. 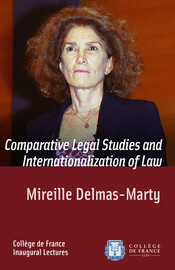 Mireille Delmas-Marty has been professor at the Collège de France, where she held the Chair of Comparative Legal Studies and Internationalization of Law from 2003 to 2011. DELMAS-MARTY, Mireille. Comparative Legal Studies and Internationalization of Law : Inaugural Lecture delivered on Thursday 20 March 2003. Nouvelle édition [en ligne]. Paris : Collège de France, 2015 (généré le 21 avril 2019). Disponible sur Internet : <http://books.openedition.org/cdf/3644>. ISBN : 9782722602793. DOI : 10.4000/books.cdf.3644. Delmas-Marty, Mireille. Comparative Legal Studies and Internationalization of Law : Inaugural Lecture delivered on Thursday 20 March 2003. Trans. Liz Libbrecht. Paris : Collège de France, 2015. Web. <http://books.openedition.org/cdf/3644>.